Harlequin 1:1 is manufactured by Cresco, a cannabis producer with 15 production facilities and 51 retail licenses in 11 states, according to their website. 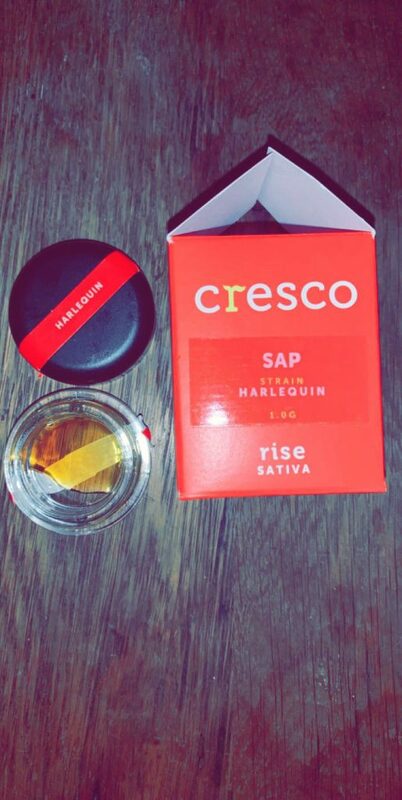 Cresco and their partners produce a wide variety of products including: flower, concentrates, vape cartridges, and edibles. Harlequin is derived from Colombian Gold, Thai, and Swiss Sativa, according to Leafly. XtaSeay and I’s Harlequin 1:1 sap was as sticky and gooey as it looked. However, XtaSeay and I both see how this might be a little much for someone who is new to cannabis or using concentrates. Concentrates are also less harsh on the lungs, compared to vaporizing flower or using a vape cartridge. Harlequin 1:1 is especially smooth. XtaSeay and I were unphased as we took long rips from our vaporizers. I agree. Personally, I find that THC can be a bit… Overwhelming. Sure, it’s fun sometimes, but other times I find myself spiraling into a whirlwind of existential dread after using THC-heavy vape cartridges. Harlequin 1:1 is the perfect balance between THC and CBD. You are able to truly appreciate CBD’s anti-inflammatory and other pain alleviating properties while still getting a very slight buzz from the THC. 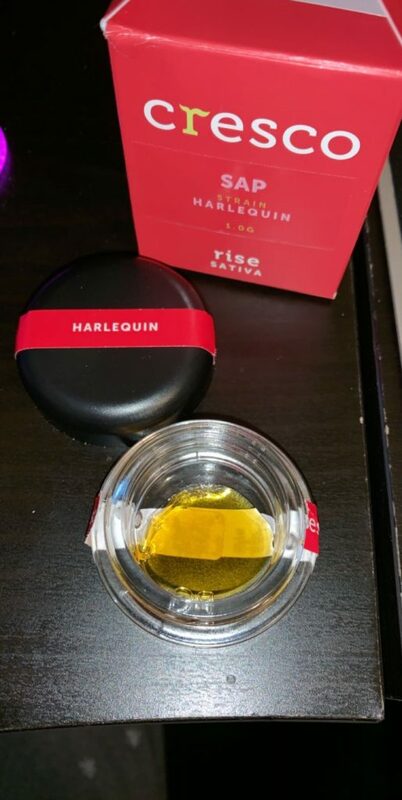 I highly HIGHLY recommend Harlequin 1:1 – especially for those who are skeptical of CBD. Harlequin calmed me down without knocking me out. I still felt I could carry on with my daily routine without having to worry about my chronic pain. Although XtaSeay enjoyed the consistency of the sap, he did find it difficult to gauge dosages and handle at times. 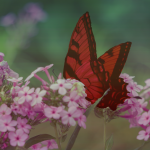 This entry was posted in 2019, Spring 2019, April 2019, Blog, Cannabis, Hot Stuff, Blog, Reviews, Medicinal Marijuana Reviews, Blog, Cannabis, PA Medical Marijuana, Blog, Cannabis, Strain of the Week, Contributors, XtaSeay.